Could any two stocks be seemingly more different, or less related to each other, than Amazon (Nasdaq: AMZN) and Rio Tinto (NYSE: RIO)? Tech giant Amazon is a household name and the overwhelmingly dominant force in online retailing in the U.S. and the West. Even its founder and CEO Jeff Bezos, is a household name. As for Rio Tinto, its name isn’t likely to ring a bell with too many Americans. For anyone reading this who can’t quite place it, it’s a diversified Australian commodity producer, whose activities cover about a dozen different commodities. But while Amazon and other tech giants are in the limelight, they couldn’t exist without the likes of Rio, that is, without companies in the business of producing commodities. But Rio would do just fine if Jeff Bezos had never thought of selling books online. That very few in the U.S. would frame such a connection among the companies illustrates a tragic blind spot in this country: the inability to see the intimate connection between technology and materials. We see them in blinkered ways, as separate worlds, and think that somehow technology on its own can continue on a path of ever-rising progress that can solve all our problems. But that’s a fantasy, because our marvelous technological instruments can’t function without the materials needed to construct and maintain them. It’s analogous to an individual human being. The most brilliant among us, the Einsteins of this world, are capable of incredible insights and discoveries. But deprive them for more than a short time of essential materials like food and water and their brains will wither and die, of no use to anyone. Our failure to appreciate or focus on the relationship between commodities and tech could literally end up costing us half the world – the Eastern half. It even could short-circuit any chance we have of remaining a major power on the globe. Right now, we are clearly vying with China for global influence. China wants control of the East, which from many perspectives is the most valuable part of the world. That’s because the East’s rich endowment of natural resources and its burgeoning populations eager to rise up into the ranks of the middle class translate into outsized economic potential. The East is where the larger share of global growth increasingly will be generated. The U.S. wants to maintain control of the West while keeping a strong grip on the East as well. In this contest, China is winning big time, at least as far as control of the East goes. That success flows above all from a tendency, ingrained in Asian culture and history, to think long term and to appreciate the intricate connections among diverse areas. An object-oriented focus may be great for developing Western-style sciences. But it is less valuable in creating cohesive and dominant civilizations. In this regard it’s worth looking at a passage from the recent speech Chinese President Xi gave to the 19th congress of China’s Communist Party. Its implications should scare all Americans – they certainly scared me. Before I cite the passage that scared the hell out of me, keep in mind the supreme importance for the Chinese of maintaining face. Losing face is close to an existential loss. Those weren’t just throwaway words, and they are a very big deal. According to the Center for Strategic and International Studies (CSIS), the construction, militarization, and continued control of those islands are critical to controlling trade in the East. Whoever has control of trade in the East can dictate the terms of that trade. And of critical importance, that includes controlling the currency in which trade is conducted – an issue with enormous geopolitical and economic significance that bears hugely on the future well-being of all Americans. But if the U.S. attempts to follow through on those words, it would mean that Xi, who has won recognition as one of modern China’s greatest leaders, would face the utter humiliation of losing face. Does it make sense that Xi would rashly risk such humiliation? No. In fact, it seems clear that he isn’t really worried this will be the outcome, despite the widespread assumption that the U.S. military is unmatched. Xi’s confidence comes from his knowledge that for the past decade or more, China – taking the long view – has been stockpiling critical metals and commodities ranging from heavy rare earths to silver to copper to even oil. Such materials are vital to military technologies. The general and virtually anyone else who studies the matter knows that China has close to a monopoly on many of these metals. Writ small this is one reason Tesla (Nasdaq: TSLA) has little chance to compete successfully against Chinese makers of electric cars. Writ large it means that China’s missiles systems – both offensive and defensive – are more than capable of protecting those critical islands. A tragedy is that the U.S. does have deposits of many of these critical rare metals but lacks the will to develop them. Let’s hope we find religion very quickly. Massive infrastructure spending rather than massive tax cuts could do us a world of good. But it doesn’t look like that will happen. Instead, a better bet is to assume trade in the East will center on China. 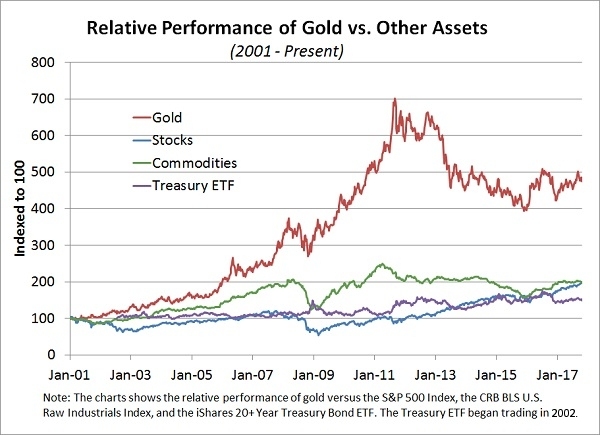 Xi’s recent speech only reinforces the case for gold, which as our chart shows has outperformed every other major asset since China joined the WTO early this century. Besides gold, a second message is that investors also should own all the other metals China has been stockpiling by investing in the companies that produce them.